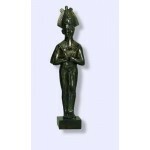 Egyptian God Osiris statue has a black and gold finish and is 8 1/2 inches tall. Osiris - King of the Gods, Lord of the Underworld, Brother and Husband of Isis. One of the most important of the Egyptian Gods, Osiris was killed by his jealous brother Set, dismembered, and pieces scattered throughout Egypt. His beloved wife Isis search for all the pieces and gave him the Breath of Life, making him Lord of the Underworld and one of the first resurrected Gods - a possible model of Christ and other Gods. 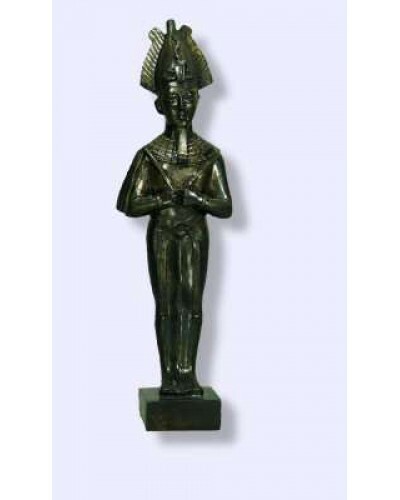 Here Osiris holds the scepters of kingship - the Crook and Flail - and wears the Atef crown consisting of a ram's horns, tall centerpiece and plumes. 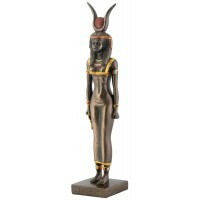 He stands 8 1/2 inches high in cast resin with a lovely black and gold finish. Item Number: SS-OK | Approximate Size (Inches): 3.00 wide x 4.00 deep x 8.50 high | Approximate Shipping Weight: 2.00 lbs.